Get away to the natural gardens and jungle of Puerto Vallarta, with a hiking tour to Mundo Nogalito, where you can find hundreds of varieties of tropical birds, flora, and reptiles. Your expert biological guide will take you on a gentle walk through the natural private gardens, down the river bed and on to a beautiful waterfall, where you can cool off with a swim. He will share with you the natural wonders of Puerto Vallarta, and help you to understand the unique ecosystem here. 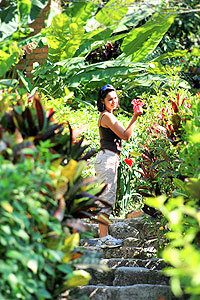 Spend some time exploring the brightly colored tropical gardens, great for photo opportunities! We'll stop for a rest at a jungle restaurant, set at rivers edge, where you can enjoy a fresh mango margarita or eat lunch. Make it a Combo! Add a Canopy Zip Line Tour! Departs From: Pick-up at various locations in Nuevo Vallarta, Marina Vallarta, Puerto Vallarta and Conchas Chinas. Exact meeting instructions will be supplied with your confirmation.